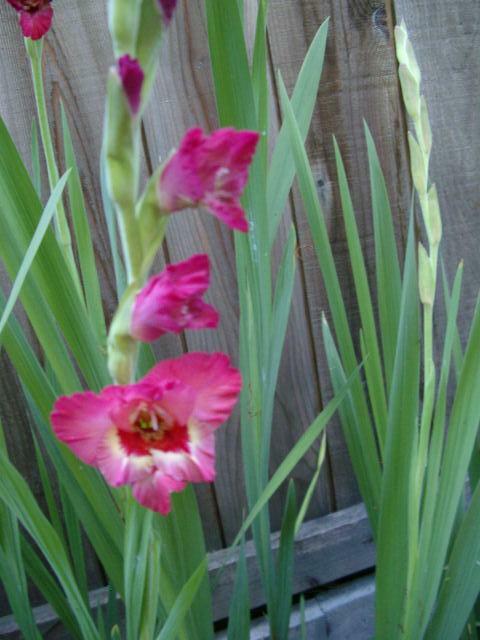 I was going to clip a gladiolus stalk and bring it inside yesterday after we got home; we have a patch of them that my mom planted for me a few years ago. A bag of bulbs on sale, late in the season, while my folks were visiting that year, hopes that something might still grow from them, a risk and a chance taken, a morning’s hard work on her part, and here we are now. Just as I went to open the sliding door, a hummingbird appeared and buzzed the flowers. No way was I going to take food from a hummingbird! Last night we got a rare summer rain, and today a lot more stalks opened up. Two of them, however, toppled of their own weight and snapped over. Fair game. There were a lot more for the hummingbirds than me at this point, and those two are now inside in a vase. Glorious. Thanks, Mom! I think we have a nest of hummingbirds in our back yard (or Chez overgrown — whatever). We saw the first one the day we moved in and have done whatever we can to foster the plants they love. My husband has gotten great shots of them feeding and even just sitting on the branches. But, the photo we never got that was perfect was when one bird took a full on bird bath in one of the flowers after the sprinklers had stopped. It was too funny, and I sort of wanted to offer the bird a towel. Oh, Patricia, that’s a wonderful visual image! Thanks to you and your Mom for bringing us such beauty! And even though the hummingbirds think that they own the place…I’m glad that Mother Nature *cut* one for your pleasure as well! I’m glad that your day at the hospital was somewhat easy…and helpful to others…you are great! !